The last couple of days I've been playing around with three.js and geo information. I wanted to be able to render map/geo data (e.g. in geojson format) inside the three.js scene. That way I have another dimension I could use to show a specific metric instead of just using the color in a 2D map. In this article I'll show you how you can do this. 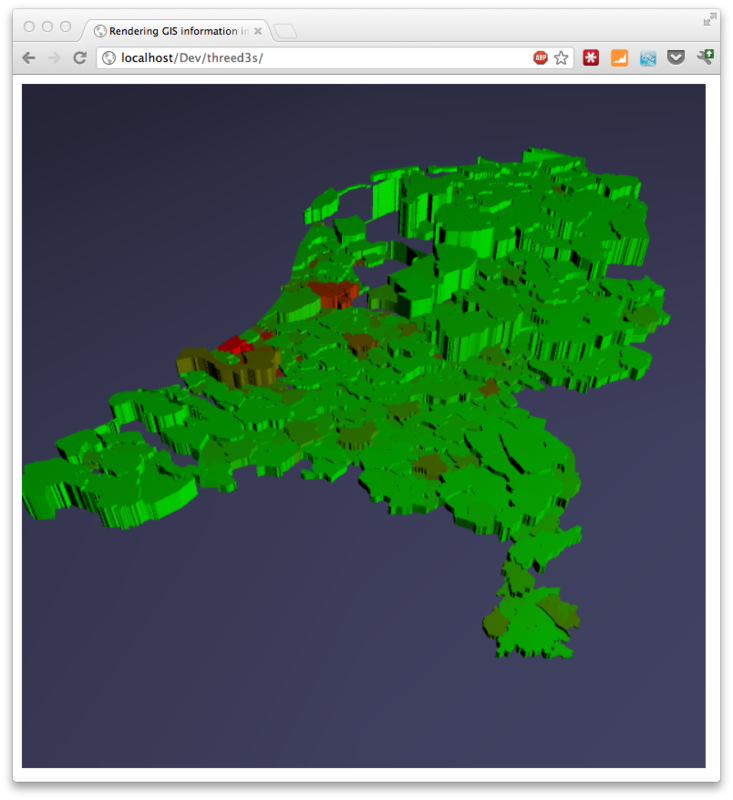 The example we'll create shows a 3D map of the Netherlands, rendered in Three.js, that uses a color to indicate the population density per municipality and the height of each municipality represents the actual number of residents. D3.js has support to load json and directly transform it to an SVG path. Though this is a convenient way, I only needed the path data, not the complete SVG elements. So to load json I just used jquery's json support. Nothing to special, the comments inline should nicely explain what we're doing here. Next it gets more interesting. I'm currently creating a new set of geojson data, but this time for the whole of Europe. So in the next couple of weeks expect some articles using maps of Europe.